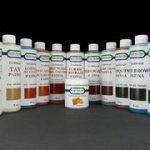 Sculpt Nouveau Solvent Dyes are an extremely versatile finishing tool. See more details below. 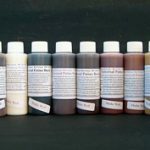 Sculpt Nouveau Solvent Dyes are an extremely versatile finishing tool. Use directly on metal, apply to a difficult material (glass, resin, etc. ), change the existing color of your finish, or repair a damaged finish. In addition, Solvent Dyes may be added to as a tint to lacquer, wax, epoxy, oils, resin or any other solvent product. They may be blended to create different shades and diluted using our Solvent Dye Thinner. All of the colors are transparent except white. For indoor or outdoor use—will not fade outdoors. *Please note: Due to shipping restrictions, Clear Guard must be sent via UPS ground only. Please be sure to select UPS ground when ordering. Thanks!